UPDATE: Dylan Winnik's death was caused by the flu, according to the Palm Beach County Medical Examiner. LATEST NEWS: Influenza B tragically killed Dylan Winnik based on the preliminary finding by State Health Laboratory using real-time polymerase chain reaction (PCR) testing. Waiting for final confirmation. 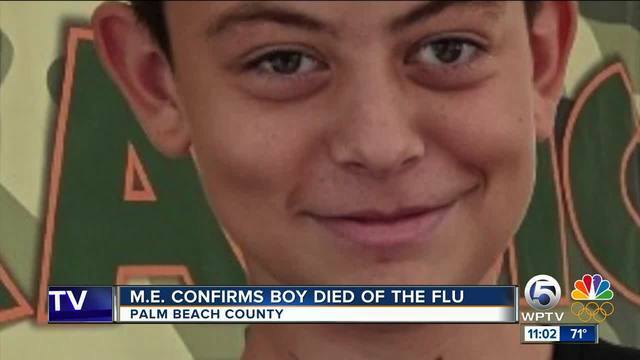 A Palm Beach County family is heartbroken after they say flu killed their 12-year-old son. The child's stepdad, Mike Medwin, tells WPTV that their son, Dylan Winnik, stayed home from school with symptoms similar to the common cold. Medwin said the boy was tired and had a runny nose. On Tuesday, his stepdad said, they checked his temperature for what turned out to be the last time, and it was in the normal range, around 98 degrees. A couple hours later he had passed away at his father’s home in West Palm Beach, Medwin said. Dylan was a seventh grade student at Okeeheelee Middle School in Palm Beach County. Dylan's stepfather described him as a typical, fun loving kid who could even hold his own with adults. "He was surprisingly intelligent, cracking jokes, very funny. If he was standing right here he would be telling jokes here with us," said Medwin. Dylan's family says they were told he died of the flu, but health officials say that cannot be confirmed pending more testing and autopsy results. The school district and health department stress there is no flu outbreak at Dylan's school, or any school in Palm Beach County.